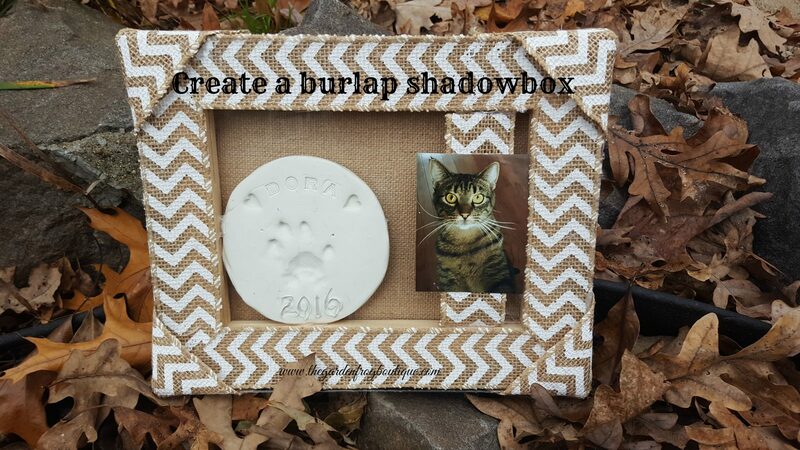 Create a burlap shadowbox from a stretched burlap canvas- simple, inexpensive, and easy to do. 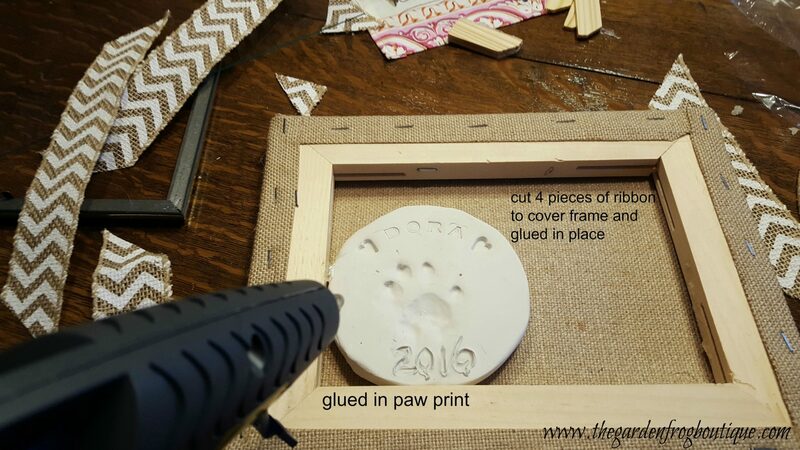 I came up with this idea the other day wandering aimlessly at Hobby Lobby looking for ideas to display the clay paw print from our recently departed Dora (the cat). 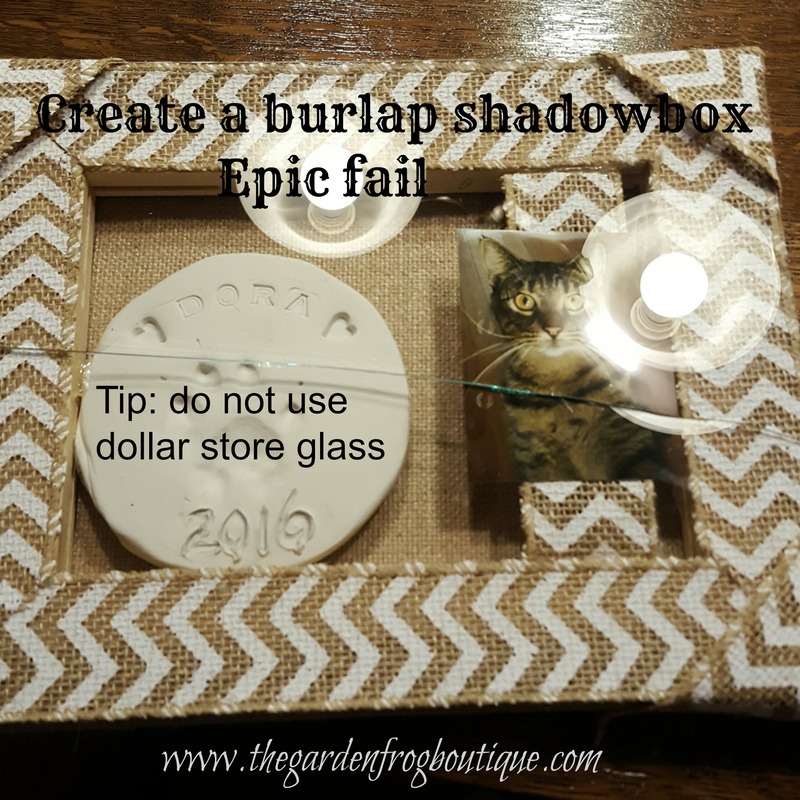 This burlap shadowbox idea, which is really a gift, ‘hit’ me when I walked up the art aisle with all the stretched blank canvases. As I walked up the aisle with all the different sized white canvases, I spotted the small section of stretched burlap canvasses in the midst of that white. 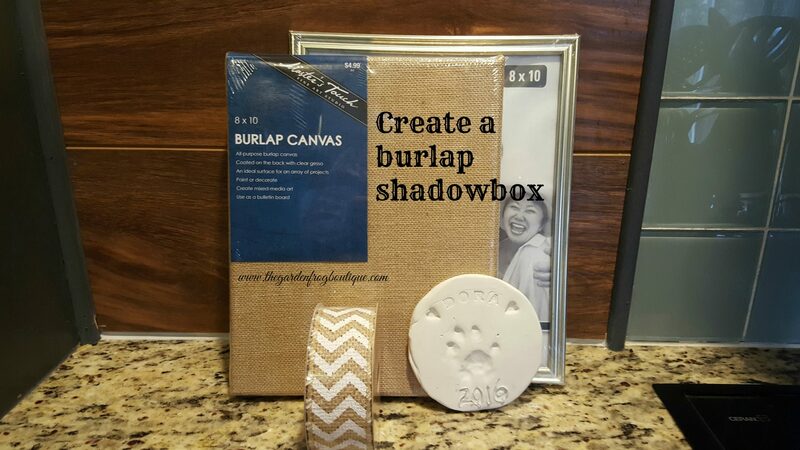 As I stared at burlap canvases for a minute or two, I picked one up and as I kept wondering to myself what I could do with this…then it hit me as I turned the canvas over and looked at the back side…it would make a perfect shadow box for the paw print. 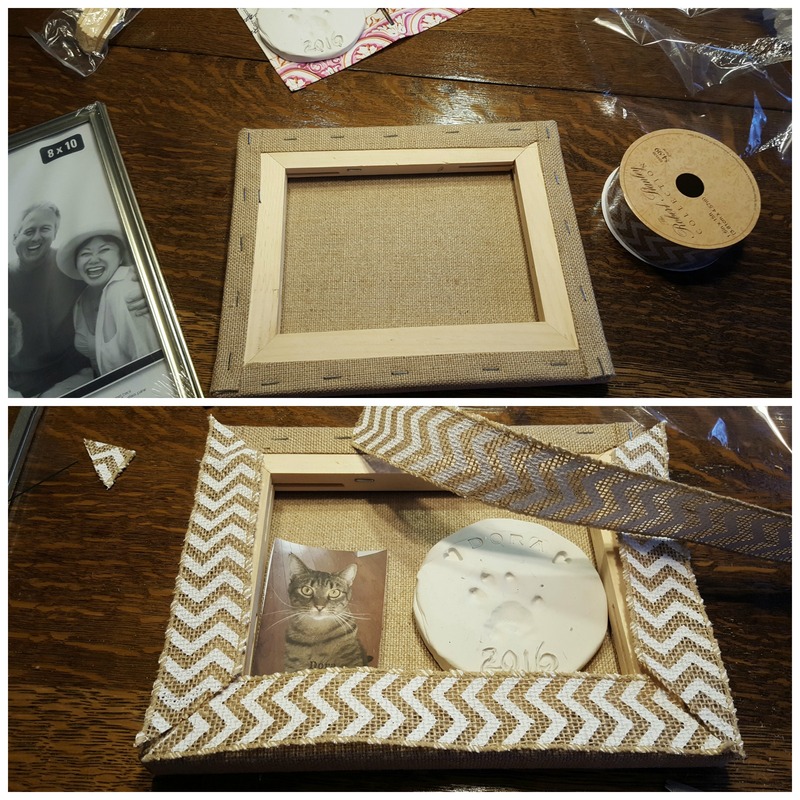 For this project I bought the 8×10 burlap canvas and found a cute white chevron print burlap wired ribbon that would cover the staples and frame on the back side of the burlap canvas. The burlap frame was on sale 1/2 off and I used my 40% coupon for the ribbon. I love the sales and coupons when creating craft projects. I decided that I needed to enclose the canvas with a piece of glass so I went to the dollar store to get an 8×10 frame-MISTAKE-do not skimp on the glass and purchase a picture frame with better glass that will hold up. Let me tell you that it was a freaking nightmare when I picked up my newly finished shadowbox and held the sides too close and SNAP was the sound the glass made as it cracked it in half. I spent half and hour trying to separate the glass, hot glue, and burlap. Thank goodness I had extra ribbon to hide the flaws; and I had an 8×10 picture frame packed in a box with a nice piece of glass. The hardest part about this craft project is cleaning up the hot glue strings that seem to land where you do not want them to be. I love working with hot glue but sometimes it is frustrating when you find the ‘strings’ on the project. Oh and another important note is to make sure that you clean the piece of glass and do not touch it! Oh man I cannot tell you how many times I had to wipe the glass. 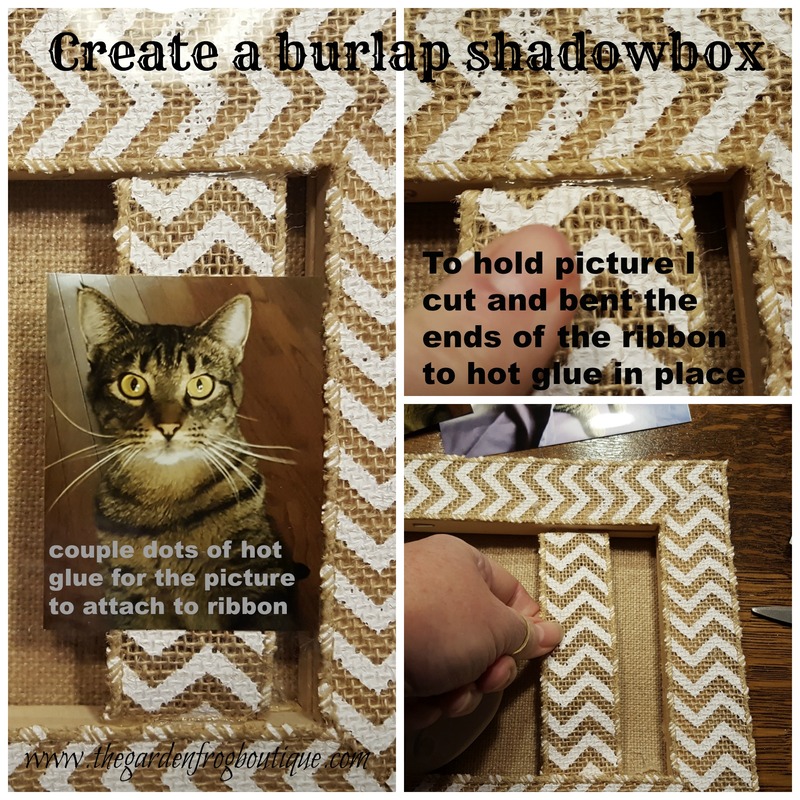 This shadow box is a Christmas gift for my oldest son who is a single bachelor living in a small apartment and I feel like burlap is more manly (LOL). Dora was his cat that ended up at my house when he moved in to his own apartment 3 years ago. Dora was an indoor/outdoor cat who loved her dogs and we knew she would not have been happy cooped up in an apartment by herself not being able to hunt snakes and rodents. 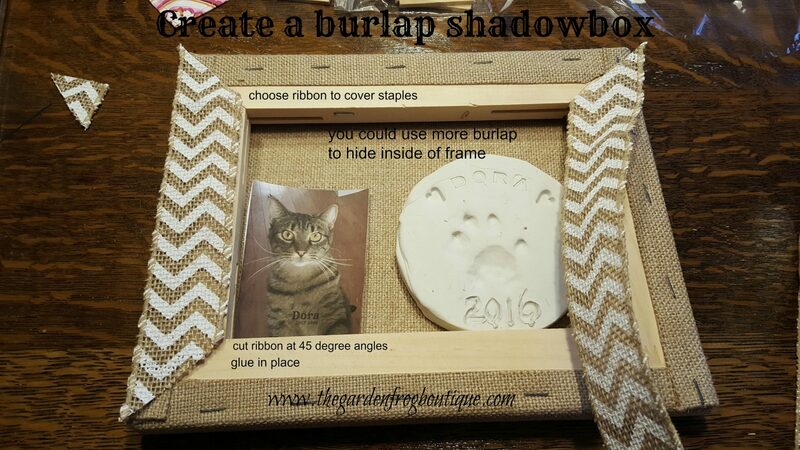 I will be creating other shadowboxes and updating pictures to show you more ideas. There is no limit to creating if you think outside the box. Thanks for stopping by and checking out my newest craft project! This is so cute and using the ribbon was a great idea. Thanks for the tips along the way! Thank you! But I am excited to say -wait till you see the 2nd one which I really love using decorative tin ribbon.